With government policies placing increased emphasis on the generation of clean, green and renewable energy, pumped hydro storage market is expected to witness extensive growth over the next few years. Deemed as one of the most effective renewable sources of energy due to its grid facility and high storage ability, pumped storage hydroelectricity has experienced escalating demand worldwide, which has indeed propelled pumped hydro storage industry size. Global authorities responsible for upholding the planet’s health and well-being, have made increasing investments in the renewable and sustainable energy sector, pumped hydro storage industry being one of the pivotal ones. In 2016, the UN reportedly invested $45 billion for the upgradation and modernization of the global grid infrastructure. In 2017, even the International Financial Corporation (IFC) announced the investment of $1.2 billion towards the generation of clean energy in India. Elaborating further, in Australia thousands of locations have been uncovered that can potentially serve as sites for pumped storage power plants. In the event that all of them are utilized, Australia can be entirely powered by renewable energy within the next two decades, leading to a major transformation in the dynamics of APAC pumped hydro storage market. The numerous investments coupled with governmental efforts to mitigate global warming such as the Paris Agreement clearly indicate that pumped hydro storage industry is bound to depict an upward growth over 2017-2024. 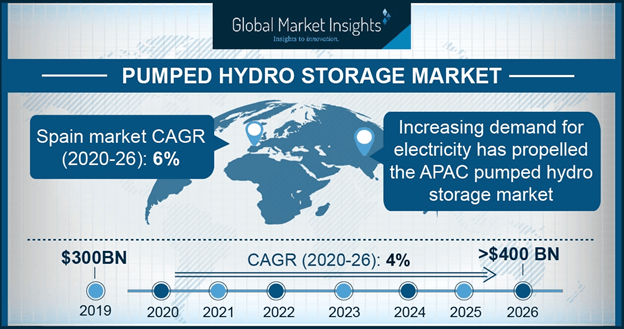 With key industry players like Enel, Alstom and Voith building pumped storage power plants, supported by innovations and research developing more cost-effective power storage, the pumped hydro storage market is projected to witness heavy expansion in the ensuing years. There is an increasing demand of energy in developed and developing countries alike. Growing demand for reliable grid support and refurbishment of the existing grid infrastructure in the U.S. has propelled the pumped hydro storage market in the country. The department of energy in the U.S. recognizes pumped storage hydroelectricity as a major source of clean renewable energy storage as it facilitates grid stabilization and enables penetration for existing electrical grids for other renewable energy like wind and solar. Europe pumped hydro storage industry has also been depicting remunerative growth prospects, with countries like Spain, Germany, Austria, Italy and Switzerland actively participating in setting up several pumped storage projects around the country. In Switzerland, for instance, Repower received approval in 2015 to built its 572 megawatt pump storage plant near Naples. The European Commission has also been proactive in bringing forth energy efficient renewable power source to all the member countries. Speaking of APAC, it is imperative to state that China the pumped hydro storage market is projected to exceed 46 GW by 2024. Favorable government policies, exponential demand and consumption of power, increasing investments, and a heavy infrastructural development are some of the most essential factors driving the growth of China pumped hydro storage industry. In 2017 in a move to bolster the flexible grid network and integrate different renewable sources of energy by 2020, the National Energy Administration of China concluded an investment of $361 billion. With the growing popularity of renewable energy sources and development of innovative battery technology, pumped hydro storage industry will follow quite a predictable growth trajectory that is estimated to surpass installation of 200 GW by 2024. From Italy to China, pumped hydro storage facilities are being embraced for their ability to balance power supply and demand across electric power grids. According to the US Department of Energy, there are 292 pumped storage hydro facilities across the globe that have a capacity of 142 GW. With 46 projects on the way that will have an additional 34 GW capacity, it goes without saying that pumped hydro storage market size will witness a major surge in the forecast period of 2018-2024.